Israeli government accepts Egyptian-brokered ceasefire deal, starting from 7 p.m. Israel-time; rockets still falling. An Egyptian-brokered ceasefire began at 7 p.m. (16:00 GMT) today (Tuesday), after being officially accepted by the Israeli government just minutes before. Prime Minister Binyamin Netanyahu informed cabinet ministers of the decision via a telephone call, just minutes before it was to go into effect. Communications Minister Gilad Erdan (Likud) and Economics Minister Naftali Bennett (Jewish Home) both voiced their opposition to the truce decision, saying the government needed to crush Gazan terrorist groups. Meanwhile, Palestinian Authority head Mahmoud Abbas announced news of the ceasefire at a televised speech in Ramallah. "We announce the Palestinian leadership's agreement to Egypt's call for a comprehensive and lasting truce, beginning at 7:00 pm (1600 GMT) today," he said at the start of a meeting of the PA's leadership. But despite the declarations terrorists in Gaza continued to launch rocket and mortar attacks even after the ceasefire took effect. At approximately 7:05 p.m. Red Alert sirens sounded in the Gaza Belt region, followed by yet more sirens minutes later. At 7:15 p.m. more rocket sirens were sounded in the Eshkol Regional Council area, indicating a further breach of the declared ceasefire. Since then, however, there have been no further reports of rocket attacks. Following the truce announcement, the Egyptian government said the deal would require the immediate opening of Israeli border crossings to aid and reconstruction supplies into Gaza. Alongside a comprehensive ceasefire, the two sides agreed to the "simultaneous opening of the border crossings between Israel and Gaza to enable the rapid entry of humanitarian aid and relief and reconstruction supplies," a foreign ministry statement said. The Egyptian-brokered deal also provides for the immediate extension to six nautical miles off the Gaza coast of the limit imposed by Israel on the territory's fishermen. It foresees "continuation of indirect negotiations between the two sides on other matters within one month of the ceasefire taking effect." Those claims contradict reports yesterday which said Israel would not open its crossings with Gaza and extend the fishing zone from its current three-mile limit immediately, but only if the truce held beyond an "initial stage" during which Egypt would first open its border to the Hamas-ruled enclave. Those same reports had claimed that Israel would only allow construction materials - which in the past have been used by terrorists to construct tunnels and for other offensive purposes - at a later stage. The announcement ends more than a day of speculation over an impending truce, with Prime Minister Binyamin Netanyahu on Monday night called together senior security sources to discuss a long-term ceasefire with Hamas and other Gazan terrorists as proposed by Egypt. Palestinian Authority (PA) sources on Tuesday afternoon claimed Israel had finally agreed to the truce, with a senior PA official telling AFP that a "permanent" ceasefire for Gaza had been reached with Israel. "The contacts that have been going on have agreed a permanent ceasefire, a (deal to) end the blockade and a guarantee that Gaza's demands and needs will be met." The agreement seeks to put a "durable" end to seven weeks of bloodshed in and around the Gaza Strip, the official said, speaking on condition of anonymity. But until the announcement this evening that Israe had formally accepted the ceasefire, there was no word from Jerusalem. 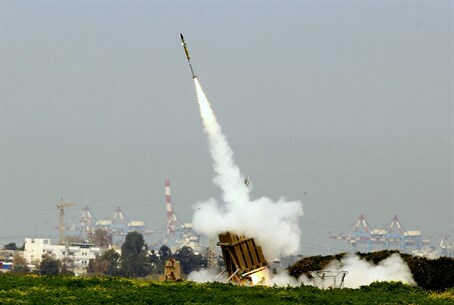 News of the ceasefire came as Hamas terrorists continue to shower rockets on Israeli civilian centers Tuesday. In an attack just prior to the announcement, one civilian was killed and six others wounded in a rocket and mortar barrage on the Eshkol Region in southern Israel. The US has already voiced its opposition to Abbas's "plan," which essentially consists of asking the United Nations to set a deadline for Israel to withdraw behind the 1949 Armistice lines, and make way for the establishment of "Palestine." Apparently Abbas intends to present his plan in Ramallah on Tuesday night. The Egyptian-brokered ceasefire reportedly will follow in the footsteps of the ceasefire reached after the 2012 Operation Pillar of Defense, and leave issues such as a sea and airport in Gaza for discussions a month after the truce. Aside from the PA, Hamas and Islamic Jihad also indicated that a ceasefire was imminent, with the sources saying Hamas leader Ismail Haniyeh has accepted the truce. Hamas politburo chief Khaled Mashaal's deputy Moussa Abu Marzouk said Tuesday "the negotiations have concluded. We've reached understandings and the resistance has won. We are waiting for a cessation of the aggression." Haniyeh was quoted on Hamas TV as saying "we are close to a political understanding," praising the "firm position of our people." Islamic Jihad leader Khaled al-Batash likewise added that "mere hours remain until the declaration of a ceasefire." Following the ceasefire's official declaration, Hamas's exiled deputy leader, Mussa Abu Marzouk, took to Facebook to declare "victory". "The negotiations with an agreement which embodies the resistance of our people and a victory for the resistance," he wrote. Despite the talk of a Hamas victory, the terror organization has taken a hard blow in a recent string of assassinations since it breached the last ceasefire last Tuesday. Among those taken out were Hamas's top financial chief Mohammed al-Ghoul, and three top commanders of Hamas's "military wing," the Al-Qassam Brigades. Those strikes are said to have triggered "panic" among Hamas ranks, and sparked a bloody campaign of executions of suspected informants. Hamas military chief Mohammed Deif was also targeted in a strike last Tuesday night; there are mixed reports as to whether it found it's mark, with Hamas claiming he survived what would be the fifth attempt on his life by Israel, but not saying anything about his condition. According to reports, Israel knew the location of the arch-terrorist as many as three days ahead of the strike, but chose not to act on the rare opportunity to take him out due to the ceasefire. As early as Monday morning Islamic Jihad was said to have been pushing for a ceasefire; the Iranian proxy group has also sustained serious damage in the course of 50 days of fighting. There has been growing frustration against Prime Minister Binyamin Netanyahu in Israel about the lack of decisive action against Hamas in the IDF operation, now on its 50th day, as well as the willingness to make repeated ceasefires that have in turn been breached by Hamas. That frustration was illustrated in a survey for Channel 2, which found on Monday that in just four days Netanyahu's approval rating dropped from 55% to 38%; at the time of the ground entry to Gaza earlier in the operation, that rating was as high as 82%. Adding to that assessment was Barak Seener, an Associate fellow at Britain's Royal United Services Institute for Defense and Security Studies, who told Arutz Sheva on Monday that Israel is “choosing not to win” the war in Gaza, saying the Jewish state "should not subject itself to norms and procedures that no military of any western liberal democracy would ever consider."